The history of epic film is rich with the story of Moses and his liberation of the Jewish people from Ramses and the Egyptians, along with the dramatic crossing of the Nile while being pursued. Cecil B. DeMille made two versions of the story in The Ten Commandments, including the famous 1956 version with Charlton Heston and Yul Brynner. 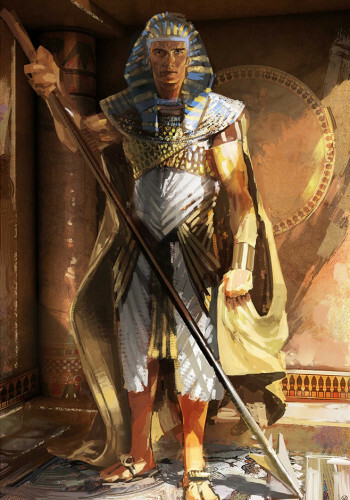 Now the epic has been modernized with Ridley Scott’s sweeping direction in the 20th Century-Fox production of Exodus: Gods and Kings. 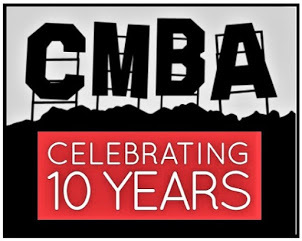 The costumes, sets, and scenery of the production do justice to the biblical epics of DeMille’s day while adding special CGI effects not known in classic film days. With a cast of Christian Bale as Moses, Joel Edgerton as Ramses, John Turturro as Seti and Sigourney Weaver as Queen Tuya, the actors bring this historic drama to life. If you missed it on the big screen, it is out now on Digital HD and Blu-Ray. Ridley Scott is famous for his vision of what style and look the movies he directs will have. One can see that as far back as his first film The Duellists, starting in 1977 and going on to Alien, Blade Runner, 1492, Gladiator, Kingdom of Heaven, and American Gangster, to name a few. Having started out as a cameraman he has a keen eye for how visual details can help tell the story and set the mood. He has forged strong relationships with his creative team, including costume designer Janty Yates, who won an Oscar for Best Costume design for her work in Scott’s film Gladiator. 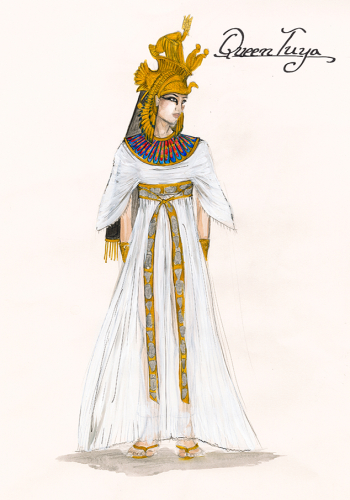 In an epic of this magnitude, costuming runs the spectrum from providing period dress for some 7000 people, including armor for warring armies, to detailed accessories for the Egyptian aristocracy. This also included jewelry like pendants, arm bracelets, multiple rings, collar pieces, headdresses, ornate belts and aprons. “Everyone wore about 15 pieces,” Yates said. “Was it blingy?” asked Ridley Scott about the movie. “Absolutely,” he said. 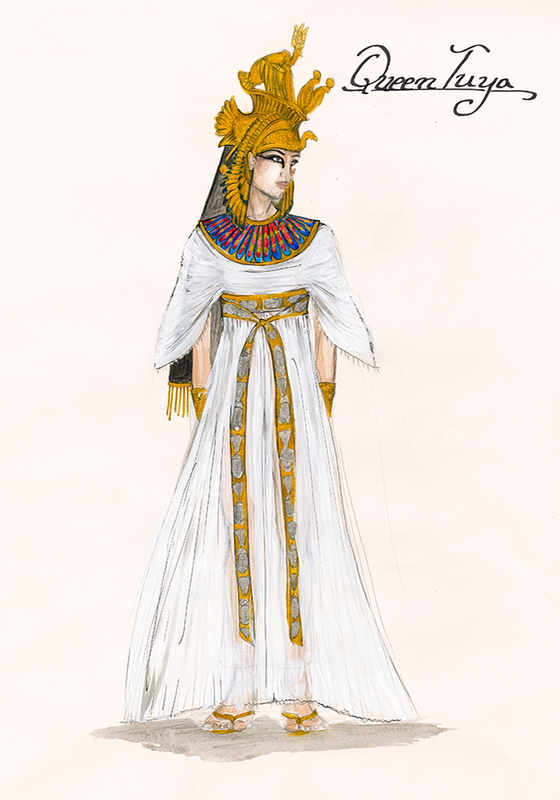 When it comes to costumes from the Egyptian period, the costume rental houses fell short of what was needed. “The last big Egyptian movie was Cleopatra with Elizabeth Taylor,” Yates said . That movie was released in 1963. But in the early 60s, the tastes ran to bright colors in women’s costumes, and foundation undergarments were used to nip in waists and emphasize breasts, looks no longer considered appropriate for period films. So Yates pretty much had to start from scratch. 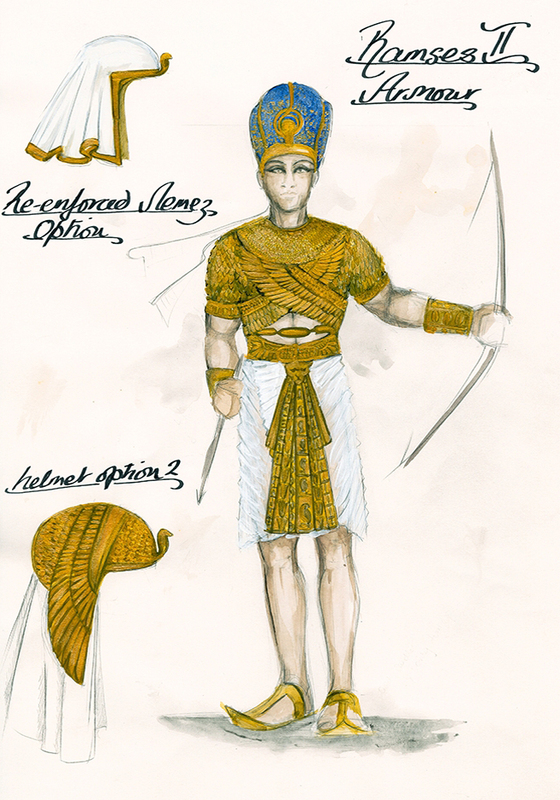 For the Egyptians that meant fabricating the costumes , from the palace guards to the principle cast members. For the Hebrews, their rustic linen costumes were historically more functional, made in a basic T-form by Italian costume houses. These very contrasts in the costumes tell part of the story. Queen Nefertari is played by the Iranian actress Golshifteh Farahani. 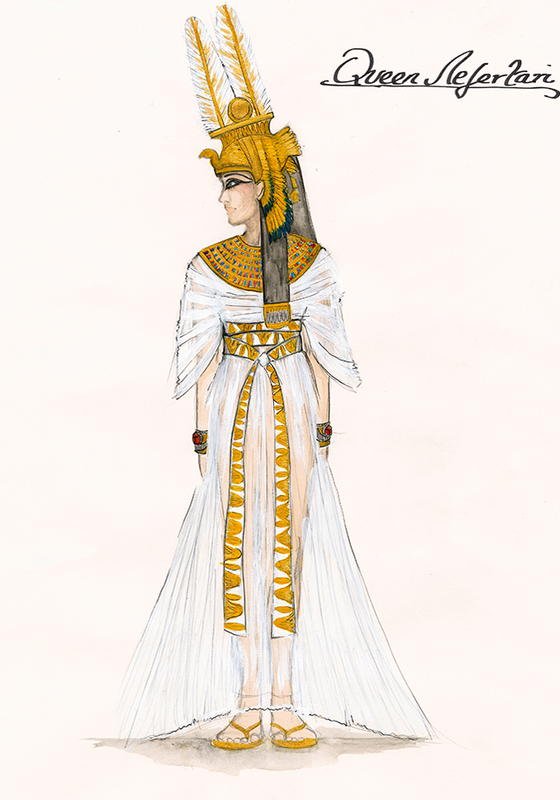 As a queen, and as one of the Great Royal Wives of Ramses, she wears a royal headdress and all the trappings of her station. 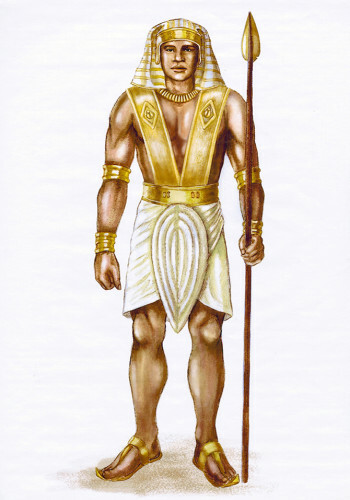 Much of the costume design elements came from Egyptian hieroglyphics and wall paintings. 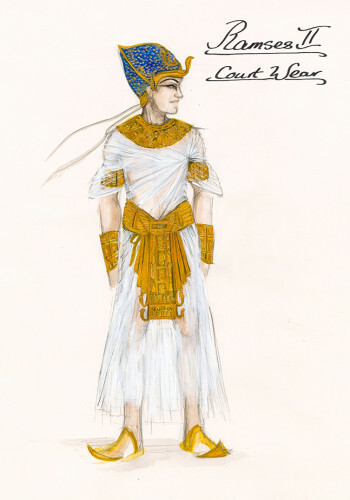 One of Yates’ favorite costumes to design was for Ramses. His suit of armor was plated in gold.That was also discovered in the wall paintings. She designed one of his helmets in a rich blue, and shaped like a bees’ nest. But a gold helmet design was used instead. This alternate design was a better match for Joel Edgerton’s face. Janty Yates loved going over-the-top on his costumes, especially since Ramses II himself was just such a vain and out-sized character. The court costume of Ramses as designed for Joel Edgerton is shown below. The costumes for Edgerton and Christian Bale as Moses were essentially “dresses” so they had to be “butched up” according to Yates. And the colors for Moses had to be made quite different than from Ramses in order to highlight their differences. Costume sketches for Moses in Egyptian armor are shown above. 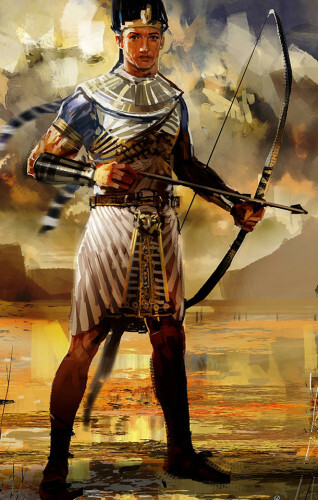 The Egyptians used a type of armor called lamellar, which was made of rectangular shaped platelets or scales which were hole-punched and laced together. For the movie the platelets were made of urethane by the UK company FBFX, a supplier of specialized costumes and props to the industry. The material is very light but tough, and it can take a finish that resembles metal. The lightness of the urethane was very functional for all the stunt men in their fight scenes. 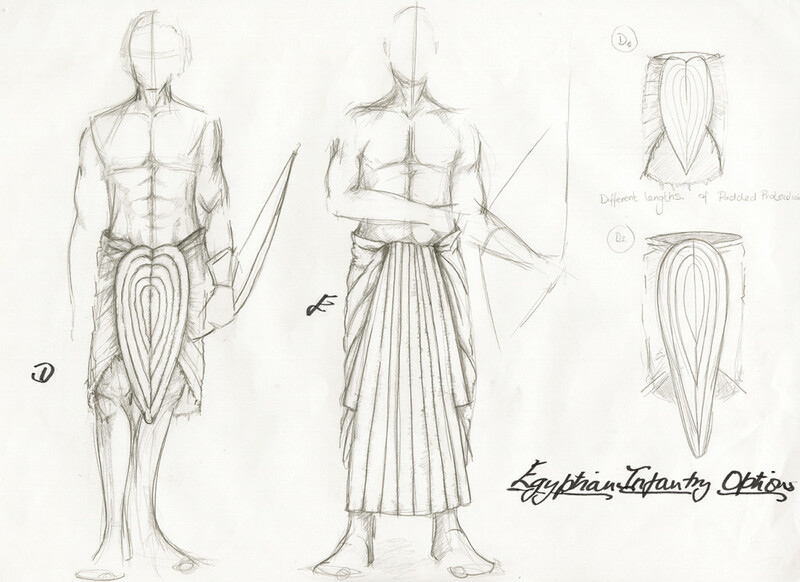 The Egyptian infantry fought mainly with a spear, or a bow, and protected by a shield as well as the loin shield shown in the sketch above and below. 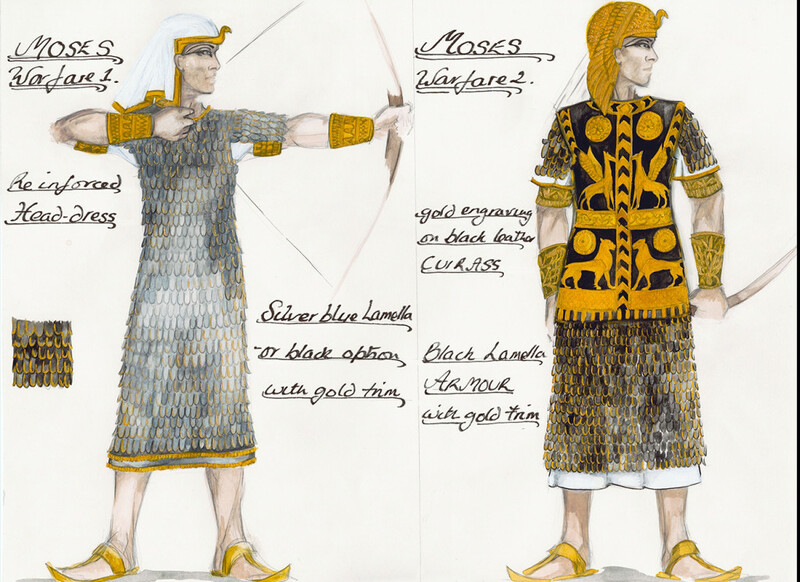 The costumes in Exodus: Gods and Kings, like all the best costumes in movies, help define character and sets the story in time and place. Here is a visual treat that makes the scenes and the action all the more life-like as a movie experience. Yates thinks it compares very well to The Ten Commandments, with enhanced special effects and without dated costumes, saying , “… to make it glorious, that was my mission.” And in the process another great collaboration between Ridley Scott and Janty Yates was made. Fyodor Dostoevsky’s novel Crime and Punishment was also the title of the 1935 film. It opens with the prologue: “The time of our story is any time, the place is any place where human hearts respond to love and hate, pity and terror.” The novel is one of the great works of literature, and its plot has been adapted for many films from the silent era through modern times. 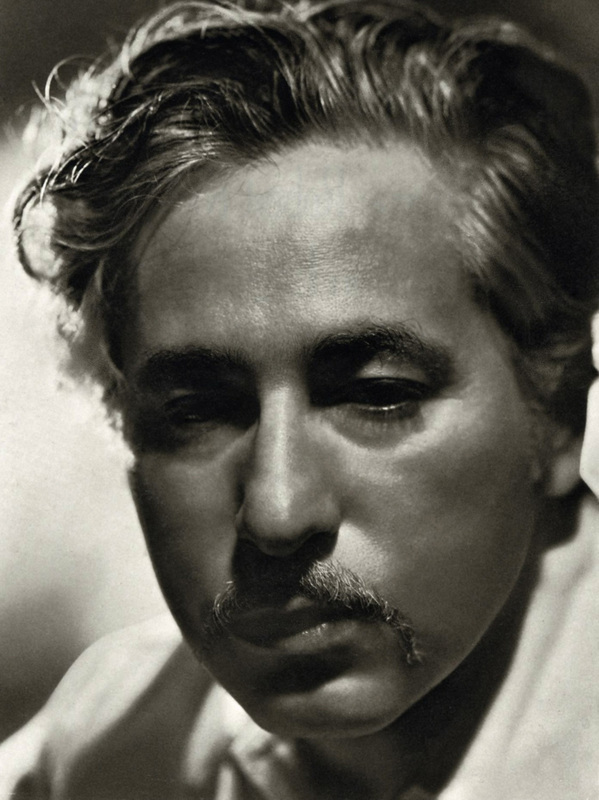 Josef von Sternberg directed Crime and Punishment, but he did so for Columbia after having been fired at Paramount after directing The Devil is a Woman, his last film with Marlene Dietrich. His last two films there had not done well and had caused various problems for the studio. He was going through the motions at Columbia and later spoke unfavorably about the movie, and that Lorre was inappropriate for the role, which has caused it to have a poor reputation. 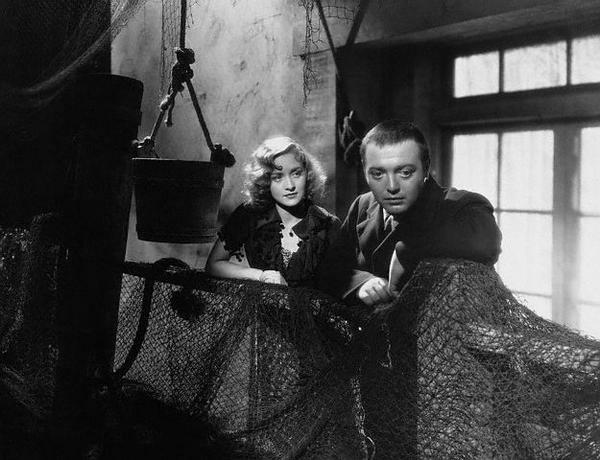 It was not the sort of glamorous films he was used to making with Dietrich, but Crime and Punishment deserves to have more respect. 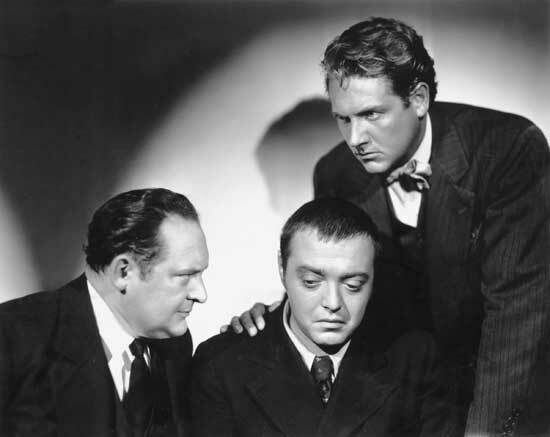 For one, it was Peter Lorre’s second American film, and virtually his only lead role as a normal character in an American movie. 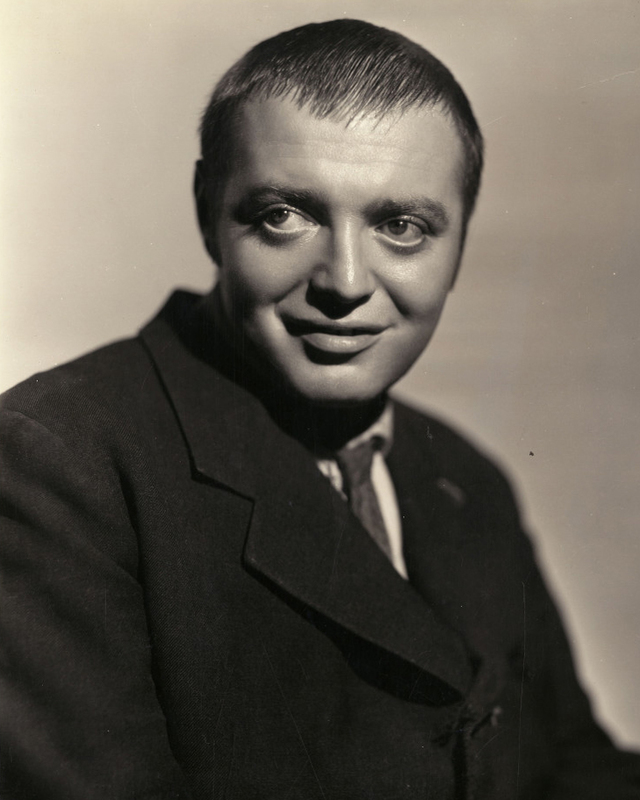 Peter Lorre had just come to the United States in 1935, and got a job at Columbia Pictures. He shared a room with Billy Wilder and they both had to learn English. He had already received strong reviews playing the child murderer in Fritz Lang’s M, and subsequently after fleeing Germany, in England for Alfred Hitchcock in The Man Who Knew Too Much. 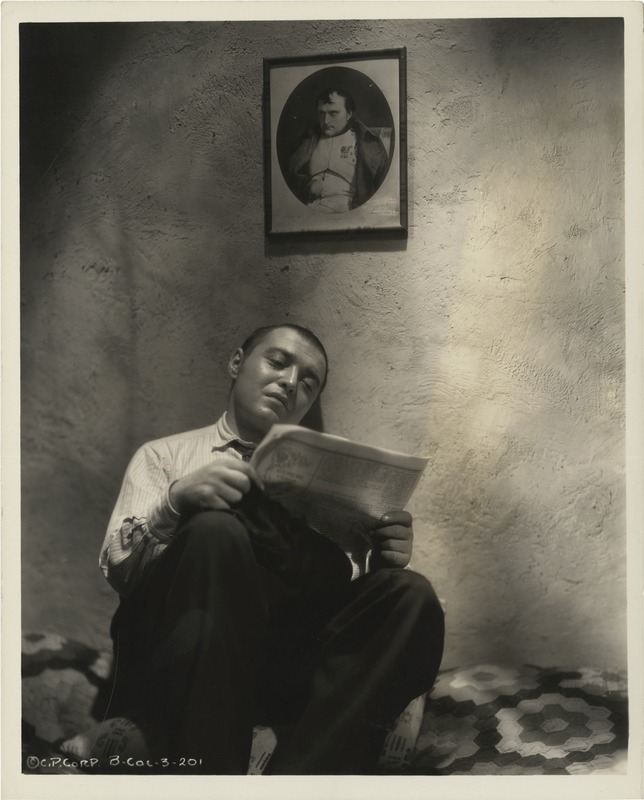 It was Lorrie who suggested to Harry Cohn that he star in Crime and Punishment, for which he would be willing to be traded to MGM to make Mad Love, which would become his first American film, while waiting. Crime and Punishment is the great Russian story of crime and the power of redemption. It would be virtually impossible to capture the novel in a single movie. But this 1935 film has several qualities. Its acting for one is uniformly excellent for the principal cast of Lorre as Roderick Raskolnikov, Edward Arnold as Inspector Porfiry, Marian Marsh as Sonya, Tala Birrell as Antonia “Toni” Raskolnikov the sister, and Elizabeth Risden as Raskolnikov’s mother. 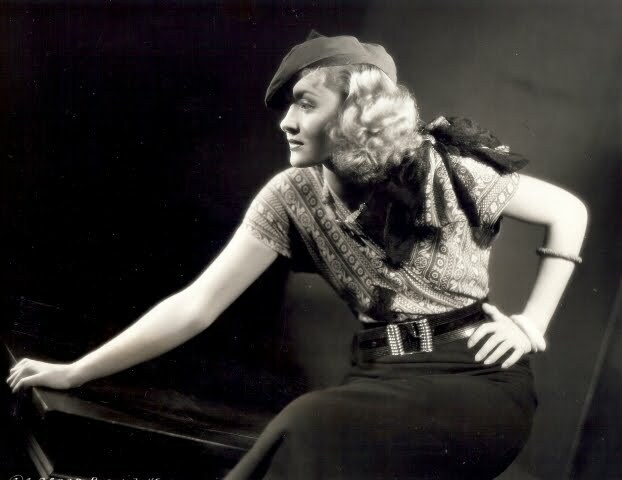 Marian Marsh is pictured above as Sonya. There is no doubt that she is meant to be enticing and alluring. A magnet for Raskolnikov in many ways. The story is about Raskolnikov, a university student that has distinguished himself by his theories and understanding about crime and criminals. He has been given an expensive pocket watch for his graduation. He believes his intelligence and moral values puts him above the law. Yet he lives in poverty, eking out a living from his writings. When he learns his family is coming to visit, he goes to pawn his watch. There he sees a young woman, Sonya, given only a ruble for her silver-covered bible and kicked out by the woman pawnbroker. She drops and loses her ruble, and Raskolnikov offers her his money when he learns she is supporting her family. 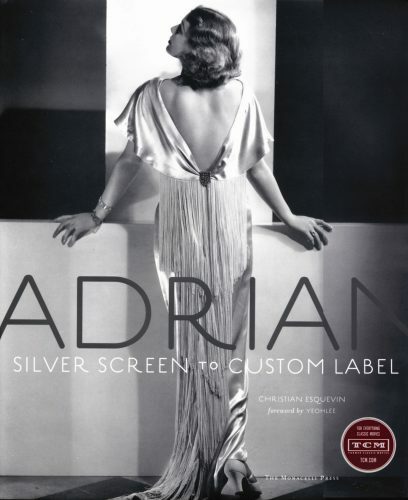 The prologue was taken as a stylistic cue for the film and its art direction. It could take place at any time, and at any place. No cars are shown in the film to date whether it depicts Dostoesvsky’s time, or the film noir heights of the 1950s. No phones ring, or voice-over narrations explain the existential quagmire of Raskolnikov’s life, but the deep black shadows and contrasting lights, with the recurring bars of his staircases provide a favorite noir trope. 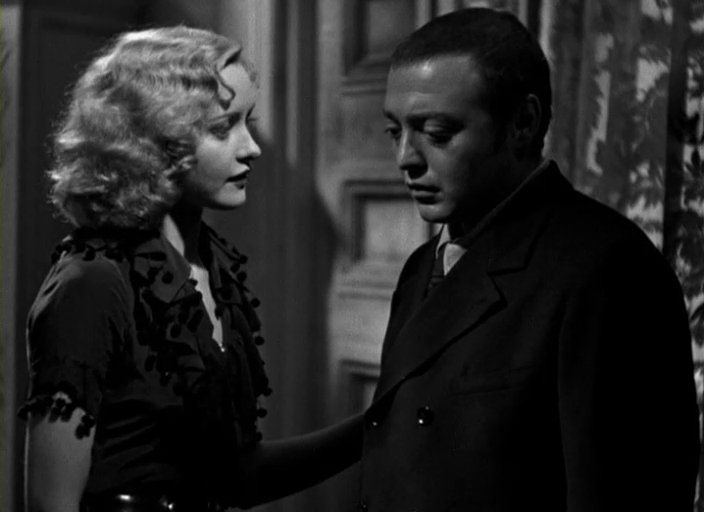 And von Sternberg shows frequent shots of Lorre taken from behind, perhaps to make his character more obscure. 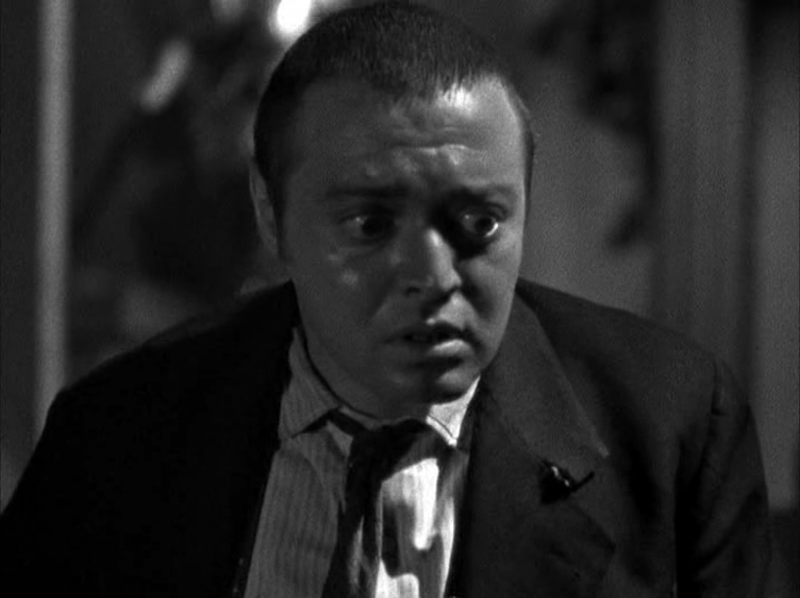 But Peter Lorre is one of those actors that would have been perfect for the silent screen. He conveys every emotion on his face without the need of words: fear; anxiety; disdain; haughtiness; sympathy; love. 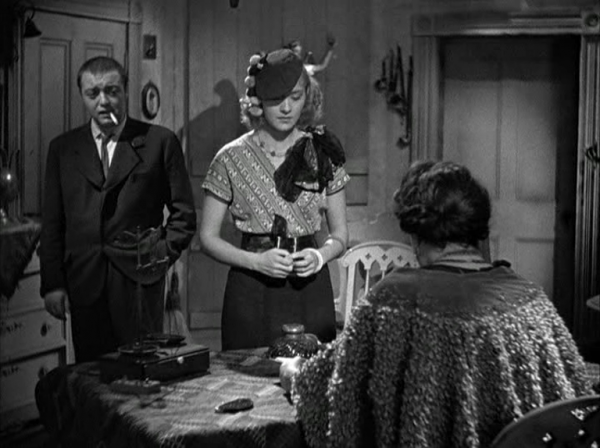 His sympathy for Sonya and sudden hatred for the pawnbroker, mixed with his belief in his own ability to flaunt the law, takes him back to the pawnbroker, as he needs money again as his family is coming to visit. Only this time he kills her and takes her money. Crime and Punishment the novel is the most psychological and existential of 19th century works of literature. 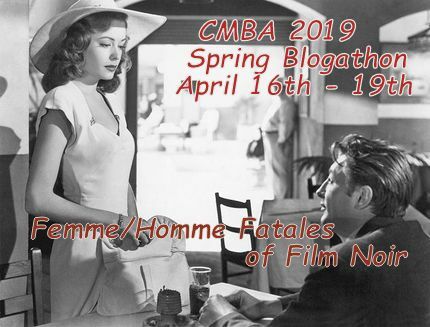 The film boils that heavy story down to a proto-film noir, a bleak work about a lonely man in the process of estranging his family – but too smart to care about the trap that is being set for him by a plodding police inspector. 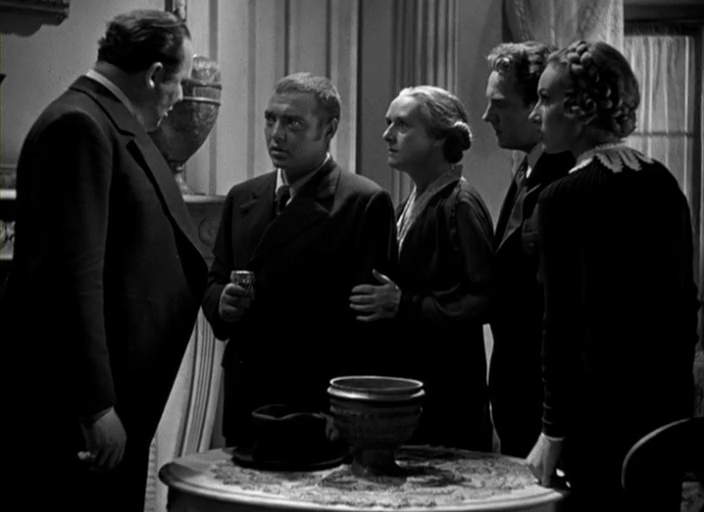 The image above shows Lorre as Raskolnikov in his humble apartment. But his opinion of himself in not humble, symbolized by the portrait of Napoleon. He sees himself like Napoleon, brilliant and a maker of his own rules. He reads articles about the crime he has committed, but he knows the pawnbroker was cheating people out of money. He is not enough above the law however for being arrested for not paying rent. There he meets Inspector Porfiry. The Inspector has heard of him and asks his opinion about the likely criminal and so begins his cat and mouse with Inspector Porfiry. 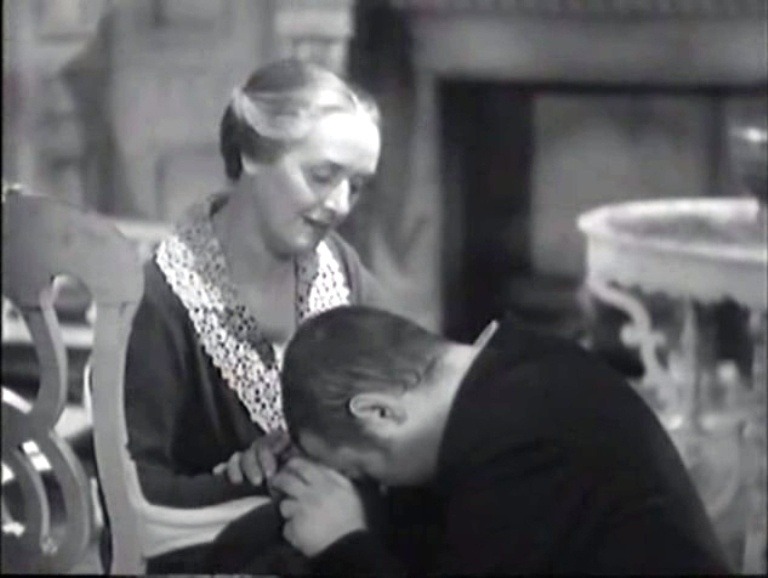 Marian Marsh plays a beautiful a vision of innocence for Raskolnikov to be lured into wanting to protect and to give away all his money to. In the book she was a prostitute. She is doubly alluring to him for having had to pawn her expensive bible for which she received practically nothing. She is a mix of innocent and guilty. Raskolnikov is also protective of his sister. He learns that her boss Grilov has forced himself upon her, and she then lost her job. When subsequently she agreed to marry a rich but older and more homely man, Lushin. Raskolnikov mocks Lushin , which breaks up their engagement. An innocent man is brought in and accused of the crime of killing the pawnbroker, This event does not fit in to Raskolnikov’s philosophical scheme. When the innocent man is arrested, Inspector Porfiry is just as happy to pin the crime on him – he has his reputation to maintain. Later, Raslknikov is appalled when the man even confesses to the crime. This shakes his psychological foundation, and his conscious at having a man punished for a crime that he committed. 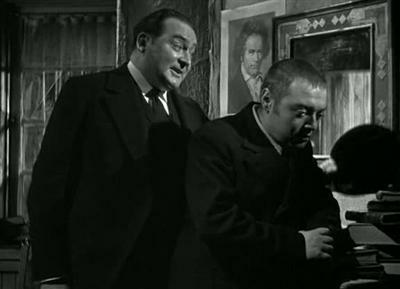 Edward Arnold as Inspector Porfiry at left, Douglas Dumbrille as Grilov at right. The Inspector insinuates himself into Raskolnikov’s life. He invites himself to a family dinner, then questions the family members about the crime. Raskolnikov becomes furious and asks him to apologize. The psychological foundation of Raskolnikov’s life is cracking. Guilt is the cause, hammered by Porfiry and steeping in his subconscious. His love of Sonya, his sister and mother makes his guilt feel even more acute, especially when he confesses to Sonya and sees her reaction. The theme of Crime and Punishment the novel and the film, is the power of love and redemption to heal the soul – even the subconscious in the grip of past sins and misdeeds. Sonya offers to run away with him. But he decides he will turn himself in to Porfiry and save an innocent man. Sonya goes with him, and will follow him to Siberia. Only then does he feel true happiness. Dostoevsky’s Crime and Punishment has often been the subject of films or film adaptations. It first appeared in a silent film version in 1917 produced by Arrow and directed by Lawrence McGill and starring Derwent Hall Caine. 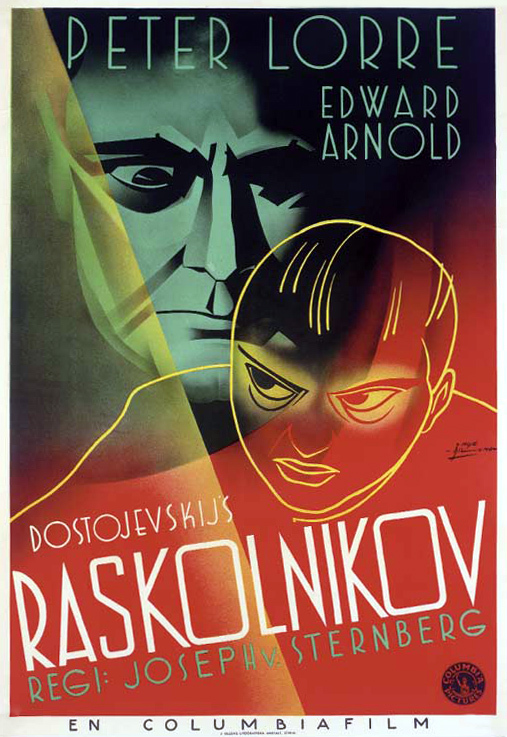 A German production followed in 1923 titled Raskolnikov, then a Monogram production came out in 1946 entitled Fear starring Warren William. In 1959 Allied Artists produced a version starring George Hamilton. Perhaps the most unlikely of modern adaptations of Crime and Punishment happened when Paul Schrader directed and wrote the screenplay for American Gigolo. He was influenced by the French director Robert Bresson and especially Bresson’s film Pickpocket (1959), Bresson was also a big influence on the French New Wave. Jean-Luc Godard reportedly viewed Pickpocket ten times. Bresson in his making of Pickpocket was himself influenced by Crime and Punishment. The story elements of the novel used in both films center on a young man who believes that he alone can judge that he is above the law, and that for some people even murder is permissible if it is done for a higher purpose, which he soon commits. Ultimately, he is doggedly pursued by a detective and he is sent to a Siberian prison, followed there by a former prostitute who he has helped, and who in turn helps him to heal. Dostoesvky’s theme was the power of love and redemption. Thus did this theme find its way in the final scene of Pickpocket, when the imprisoned robber for the first time tenderly kisses Jeanne, a young woman he had previously scorned, from behind bars and says, “…to come to you, what strange journey have I had to take.” This scene was repeated in American Gigolo. 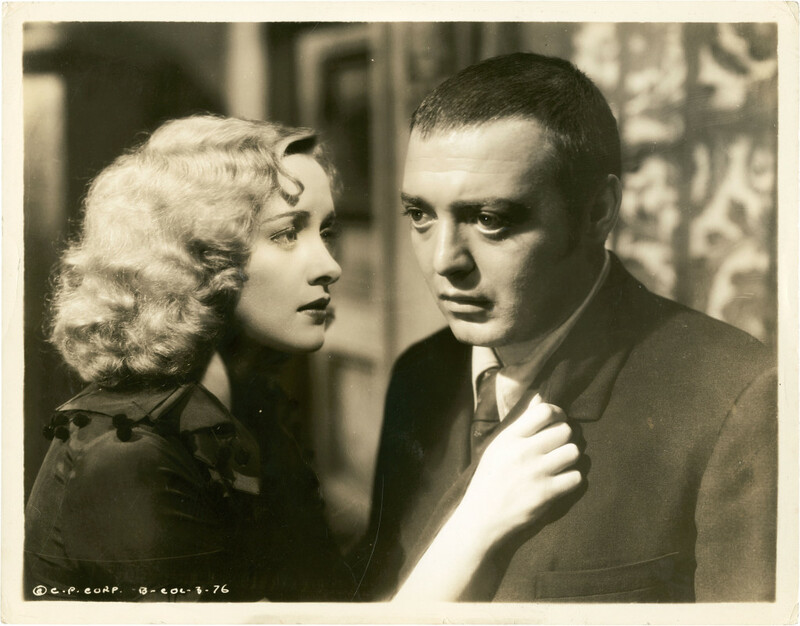 And in this more chaste version of Crime and Punishment, 1935, Peter Lorre and Marian Marsh are seen together as Raskolnikov and Sonya, where he is turning himself in, eyes heavenward, yet still with their future together.